Julie Cigman uses a vast range of personal vignettes to explain best practice when encouraging boys to write. The theory is brought to life with these recollections, making this a very informative and enjoyable book to read. The ideas for working together with boys are beautifully simple and are tried and tested. This book would support both experienced practitioners and those who are just starting out, because it is so accessible and uses examples in such a delightful way - Kathy Brodie, Early Years Consultant, UKEarly Years Consultant, UK. Julie Cigman has given us a practical and principled way forward in supporting boys' writing. This book is shot through with rich examples of effective practice and deserves to be widely used. Young boys' writing is bought alive for us in these pages,　and the groundedness in practice demonstrates how boys' achievement in writing can be appropriately supported from an early age. This is a book for everyone interested in promoting early literacy development. An excellent read and a practical compendium -Professor Cathy Nutbrown, School of Education, The University of Sheffield. How do we give young children a ‘writers’ voice’ and allow them to become creative and inspired writers? 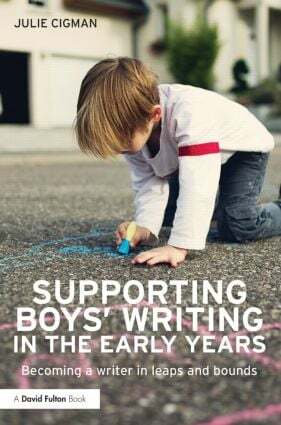 Supporting Boys’ Writing in the Early Years shows you how you can help boys to become confident and capable writers by supporting them to write in ways that make sense to them – on the move, outside and inside, in dens, in bushes, in mud, or sprawled on the floor dressed as superheroes. Drawing on four boys writing projects involving over 80 practitioners, the book reveals that a playful, child-centred approach can allow boys and girls to develop a writers’ voice and raise attainment in writing as well as enhancing all aspects of young children’s development. practical ways to create a partnership with parents that builds on their strengths as educators at home. This book will help you to create a truly enabling environment for writing and is essential reading for all those that want the children in their setting to become confident, motivated and creative writers. Julie Cigman is an Early Years teacher, trainer and consultant. She runs courses and workshops on early writing and supporting boys' learning in the EYFS.